Trailhead: Gas Well Round Mtn. Rd. 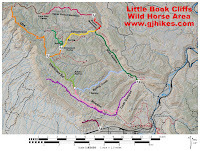 The Round Mountain trail is located in the BLM Little Book Cliffs Wild Horse Area near Grand Junction, Colorado. The trail begins at a gas well near Round Mountain where it makes a somewhat gradual descent into Main Canyon and comes to an end at a junction with the Main Canyon and Cottonwood Canyon trails. Round Mountain can be combined with other trails in the area to create various routes for backpacking excursions. The Round Mountain trail might get hiked most often by beginning at the Coal Canyon trailhead and hiking a little more than 5 miles up Main Canyon. For those that aren't all that excited about a hike that would be over 14 miles round trip, that don't mind a little driving, you can motor your way around through DeBeque to the gas well at the top of the trail by following the directions for the Cottonwood Canyon trail or just go to DeBeque and follow the signs to the Wild Horse Area. When you get to the sign in this photo turn left toward Round Mountain rather than going all the way to Monument Rocks. From the Indian Park sign you will pass Low Gap Camp after 2 miles, where there is a restroom, and reach the gas well a little past the 6 mile point. Under good conditions the entire stretch from DeBeque to the gas well can be made by a vehicle with moderate ground clearance. The trail is overgrown a bit by wisk broom snakeweed as it starts out but it becomes a little more defined as it continues. 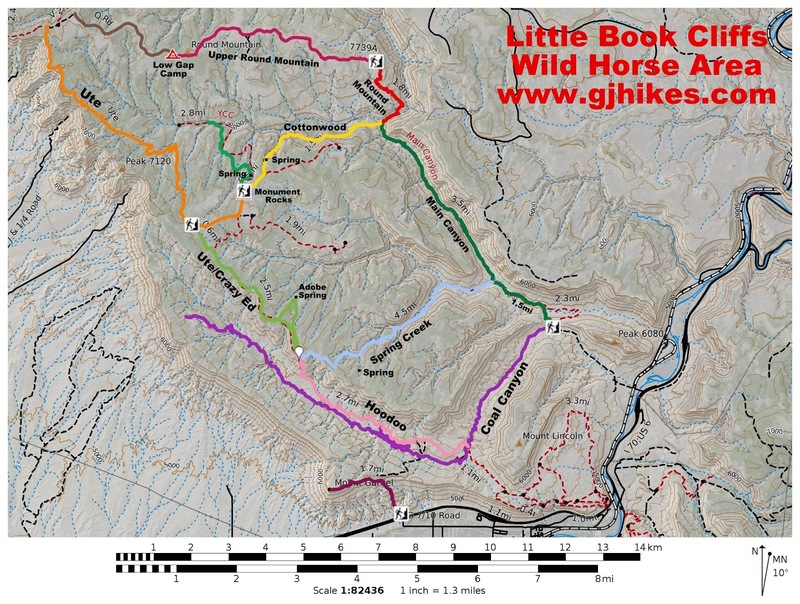 This trail gets most of its use from wild horses and big game animals like deer and it isn't very well worn in places. Each outcrop of the short sandstone cliffs lends its own character to the trails natural scenery as it switchbacks and weaves its way into the canyon below. Some of the trees along the trail in the middle of the mountain have flagging tied to their branches. There are a few steep sections of trail where the dirt is loose and rocky. It is the typical fare that is found on most of the trails in the area. As the trail get closer to the bottom of the canyon it travels down a sagebrush covered shoulder. Across the canyon the Cottonwood trail is coming down a similar environment as the Cottonwood, Round Mountain and Main Canyon trails all converge upon the same spot. The trail enters the wash about a quarter mile or so before it reaches its end. It is much easier to take the side trails that leave the wash and travel along the banks rather than to hike down the wash itself. After passing through a gate the trail comes to an end at its junction with the Main Canyon and Cottonwood Canyon trails. This was the turnaround point for this post. Backpackers will find a nice campsite under a large cottonwood tree not too far down Main Canyon. It is best to bring all the water that you will need and not count on finding any pools along Jerry Creek. If you are hiking up the Cottonwood Canyon trail there is a spring near the top that generally keeps the horse trough full. The trail is marked a little better heading in the uphill direction. There are markers like this one in a few places that are only visible when going uphill. The Round Mountain trail is actually a pretty nice trail if you don't mind having to concentrate on the route finding in a few places. We got off course momentarily in an open area heading downhill but quickly corrected back to the proper route. We erected a cairn at that spot to make it a little easier for the next person. Round Mountain is definitely a trail that is seldom used. If you would like to see it for yourself then all you have to do is 'Take a hike'.